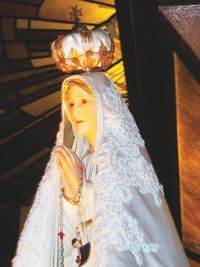 The Fatima Pilgrim Statue has been traveling around the world since 1942 and has often been called the “White Lady of Peace”. Many astonishing stories of her travels have been written down in countless books. In Lisbon and Brazil, white doves refused to leave the Fatima Pilgrim Statue’s feet and stayed with her for days without food and drink. She has been across Africa, U.S., Europe and Asia and has been greeted enthusiastically not only by Catholics but also by Muslims, Buddhists, Hindus, and Sikhs. Well, that she would cry in Las Vegas, city of gambling and of many pleasures is understandable, you may say! When she was crowned in 1946 as "Queen of Peace'', her crown which weighed 1,200 grams was sparkling with diamonds, pearls, rubies, emeralds, turquoises and other precious stones - a gift from the Portuguese women in thanksgiving for Portugal's preservation from the Spanish Civil War and World War II. In recent years, her crown gained yet another precious object. Pope John Paul II sent to Fatima the bullet which felled him in the assassination attempt on his life on May 13, 1981, 64th anniversary of the feast of Fatima. According to the Holy Father, it was the Mother's hand which guided the path of the bullet and spared his life. More than 90 years have passed since Our Lady of Fatima appeared to three simple children in Fatima, Portugal and gave a series of messages on the future of the world and her own blueprint for peace. Over the years, many of her devotees have faithfully complied with her requests, among which was to pray the Rosary daily. Among other things, Our Lady warned that Russia would spread atheistic communism but likewise held out hope that in the end, it will be converted. While the curtain happily fell on the second millennium with the celebration of the Great Jubilee Year 2000 and the much-improved political landscape in Europe with the collapse of communism, the first years of the third millennium revealed another enemy. We all have seen the repercussions of terrorism, even in our own backyard. We also realize that the dangers from nuclear war still abound. We look around for answers. Most of all, we look to Our Lady of Fatima, the "White Lady of Peace". During the past weeks, in the Philippines, we particularly paid homage to the International Pilgrim Virgin. What could she be saying to us? More than just giving her our personal petitions, isn't it more important for us to know also what Our Lady of Fatima is trying to tell us? We found ourselves trying to reflect on and imagine what Our Lady would be telling us now. If we were to pick out the most important among Our Lady's messages, it would be this rallying cry: "Pray the Rosary everyday!" Pope John Paul II himself gave the Rosary a much-needed boost when he declared the period October 2002 to October 2003 as YEAR OF THE ROSARY. As we look at the beautiful face of the International Fatima Pilgrim Statue, let us all remember that she is more than just a pretty face. She is the Seat of Wisdom, the Gate of Heaven, the Mother of the Church, the Mother of God. When she tells us to pray the Rosary daily, we all have to obey. What are the consequences if we don't obey? If we are indifferent and do not have the zeal? If we think we are too far away from the killing fields? Or if we are simply “too busy"? I wish I knew. But I dare not even think of it. Is it right to always presume God's mercy? What I know, in all faith, is that a simple Rosary from you, dear reader, can make a difference in our world. Click here to return from Fatima Pilgrim Statue to Understanding Mother Mary.